My first custom… in 3 hours! I was on vacation last week in Maine, we camped near Acadia National Park on Mt. Desert Island. The weather was not so great, but the knife-related action was surprisingly good! I gave away two SS crickets, one to my father who is having his well-used Dragonfly repaired, and one to a neighboring camper who likes to woodwork in his spare time. 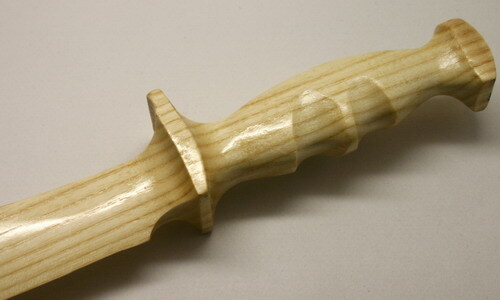 He makes all kinds of things like walking sticks, wooden bowls, and recently is free-handing knives. He had a few beautiful pieces, and I complimented them. Much to my surprise the next day he walked over with a chunk of alderwood 2×4 and asks me what kind of pattern I would prefer. I chose a Bowie-kind of style that he had done in the past. He did this entire piece in about 3 hours, including the lacquering. Not bad, eh? How did he do this? Simply with dremel tool attachments and a heavy duty cable hooked up to a small drill press (in his RV.) He had a variety of sanding discs and bits, and has an amazing ability to grind and keep the blade true. 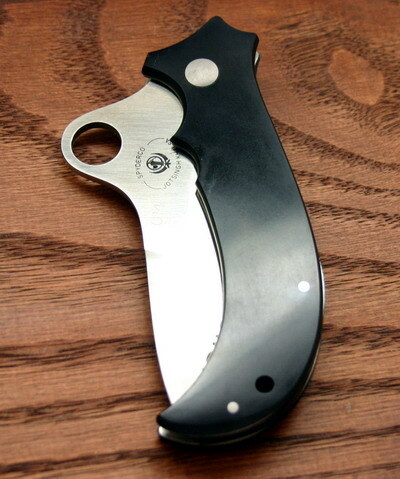 Very comfy handle, the blade is about 9″ and OAL is 14″, weight is only 3oz. I was using my Swamp Rat CT that week, and I wished that the wooden Bowie was real so I could test it head to head with the CT. 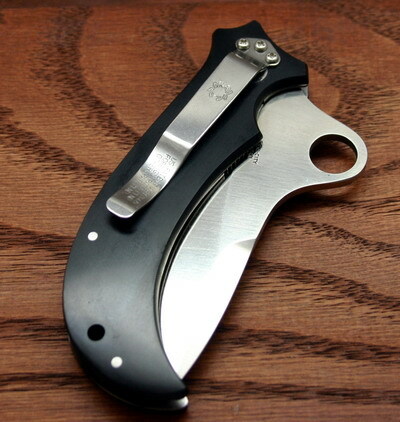 Even more amazing, he uses a convex grind on both the top and bottom of the blade in many areas. 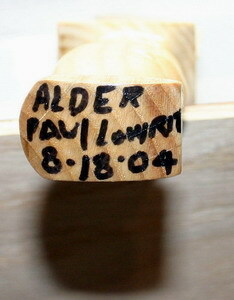 The gentleman’s name is Paul Lowrie, he made his mark in unassuming permanent marker on the pommel showing wood type, maker, and date. Not a user to be sure, but one I will cherish. 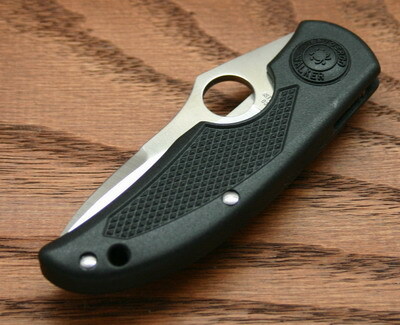 I am glad I brought extra Spydercos on this trip, as I was able to give Paul an SS PE cricket for his trouble, as he would not take money. Paul is thinking of getting into making real knives with tool steel, and I recommended Wayne Goddard’s $50 Knife Shop book to get him started. Hello my small but dedicated audience. The comments for the site are working again. You have to register with Typekey, but they do work. I was having pr0n spammer problems (you know, because this site is so popular.) Anyway, I am back from vacation and more special knife blogging to come, including a custom knife that I had made just for me…. Muchas gracias to Director Mitch for making me my very own blogstamp. I am trying to be ambivalent about his choice of brand here. Ginsu is kinda like the Rambo knife, we cannot ignore its status in the realm of knives, although its pedigree remains… ahem… somewhat cheezy? If you’re buying this krep out of Hong Kong, you can get it for less than 80 cents for a 10 piece set. 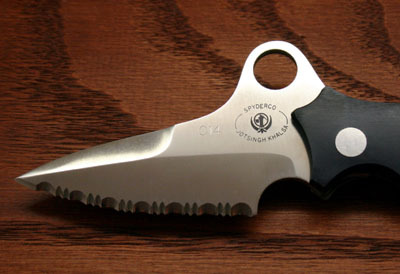 So since we’re talking about good quality knives at disposable prices, let me list my two favorties: no kitchen is complete without the Victorinox 3-1/4″ Red Parer and the Forschner 4-1/4″ Paring Knife. These guys are dirt cheap and sharp as anything in my collection (due to the thin blade.) HIGHLY RECOMMENDED!!! This entry brought to you by Alexander Valley. The JSK. An opportunistic purchase from a sale in Japan. I met Jot at BladeWest 2003, he was a nice guy and quite a character. This was a full SE version, collector # 14. The serrations are not as aggressive as some of my others (SE cricket for instance.) The Micarta is smooth and mellow, like a fine cabernet. 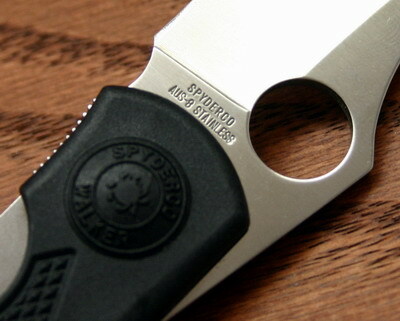 This knife typifies Spyderco in that looks take a back seat to function. Like the Dodo, one of the main reasons I bought this one is due to its unique looks. 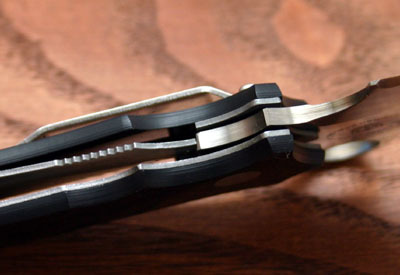 Smooth opener, but due to the hole placement, your thumb travels much further along the opening arc before locking. Liner lock in good shape. A keeper, albeit somewhat a safe queen. OK, back in the saddle. Picked this one up in Japan for a song. I think it was from someone liquidating a collection. Michael Walker Lightweight. I always liked the blade shape and unusual swedge on the top. 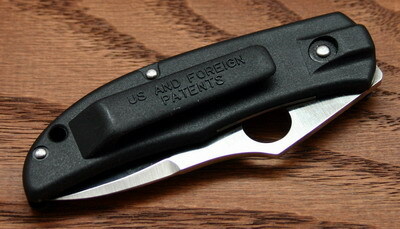 The integrated clip is a retro-plus feature for me, as it assures no car scratches or wall marks. Nice texturing on the FRN front scale, classic pistol grip style. AUS8 has proved a fine steel for general use, my Lum FB has seen lots of use and the edge holds well. Not S30V, but good for a lightweight utility piece.